Pentax’s DA Limited range is highly respected for both build and image quality – they’re also known for their unique ‘drawing style’ or image rendering, making them one of the most compelling series of lenses ever made specifically for APS-C cameras. 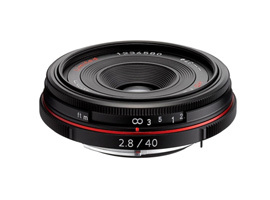 With an overall length of just 0.6” (15.4mm) this pancake-style model is one of the smallest in the range, though the firm introduced an XS version based on the same optical construction as this lens, which is no thicker than a lens cap. This HD version is a refresh of the earlier smc model and includes a new rounded diaphragm opening and improved coatings. In all other respects it’s the same with a high-grade aluminum outer and an optical construction of 5 elements in 4 groups. Although there’s no room for a built-in AF motor it has autofocus using a screw-drive style mechanism with the actuator based in the camera-body. This tiny model focuses down to 15.7-inches (40cm), adopts a 49mm filter thread and weighs just 3.1 oz (88g). It’s available now at $549. 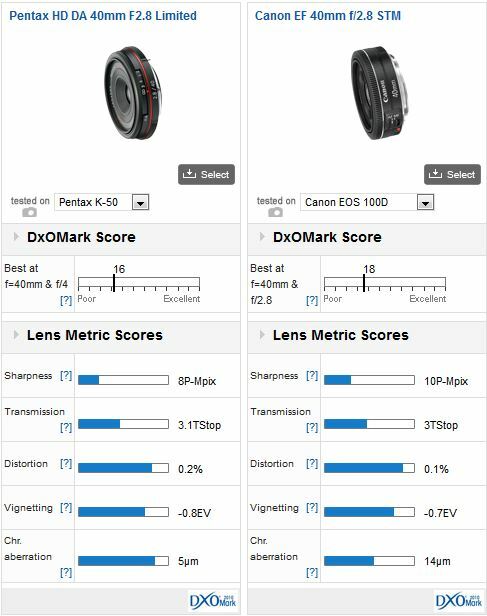 An overall DxOMark score of 16 points is slightly disappointing but the 40mm f2.8 Limited has very low chromatic aberration, and good control of both vignetting and distortion. Pancake lenses like this rarely have consistent sharpness across the frame, and this model only has good sharpness in the center when stopped down. Wide-open, sharpness is only moderate, but fortunately that improves in the center significantly at just one stop down from the initial aperture. Peak sharpness is measured at just 8-Mpix at f/5.6, which is a little low on the K-50. Although the XS version is based on a similar design to the Limited models, it has slightly better transmission than the new HD model but it has much higher levels of chromatic aberration than either. 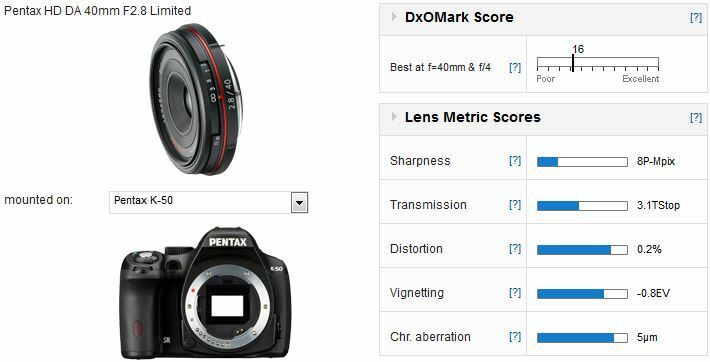 In terms of sharpness, the HD and XS models perform similarly at the initial aperture – with only moderate sharpness, whereas the older smc Limited model has slightly lower sharpness still. At f4 the new HD model is slightly sharper in the center but from f5.6 onwards they have similar sharpness. We were interested to compare the 40mm lens with the new EF 40mm f2.8 STM from Canon. 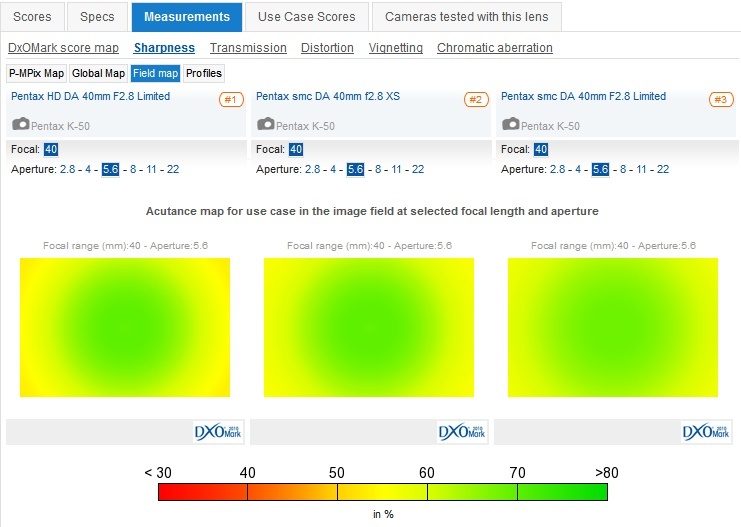 Keep in mind that although the two are the equivalent to a 60mm on APS-C cameras, the Canon is in fact a full frame lens and the results on the Canon EOS 100D used for testing reflect a crop from the center. Unsurprisingly perhaps, the Canon exhibits slightly less distortion and vignetting than the Pentax but it has very high levels of lateral chromatic aberration by comparison. As for sharpness, the Canon is slightly sharper at full-aperture and it has reasonable corner sharpness albeit not particularly uniform across the field. The Canon is also slightly sharper across the field when stopped down with peak sharpness of 10P-Mpix at f5.6 – a slightly better performer in terms of uniformity. With only a slight improvement in performance over the earlier iteration there’s little reason for existing Pentax users to upgrade, however, anyone considering adding one of these to their system will not be disappointed.